Go over the rainbow with the 2015 summer musical production of “The Wizard of Oz.” Darrin Riley, Delaine Gates, Stacy Hawking, and Karen Watkins will lead the production team for the Murphy USA sponsored family musical which opens in the Callaway Theatre on July 16 and continues through July 26. Auditions for “The Wizard of Oz” are scheduled for May 30, June 1 and 2. Darrin Riley director and set design • Riley has worked in community, regional, and professional theatre in the United States and the United Kingdom for over 30 years. He has also worked within film, fashion, and television in San Diego and Los Angeles, California. Darrin has designed for the National Academy of Television Arts and Sciences’ Emmy and Academy Awards. At SAAC, he has directed “Agatha Christie’s The Mousetrap,” “Agnes of God,” “Cabaret,” “Chicago,” “Rodgers and Hammerstein’s Cinderella,” “Willy Wonka,” “Hairspray,” and “Joseph and the Amazing Technicolour Dream Coat,” Riley is currently the drama instructor and an Arts in Education artist for SAAC. Delaine Gates assistant director • Gates started in 1988 with the El Dorado school district teaching English, but transferred to drama when the position opened up. Since 2004, she has served the district as fine arts coordinator. Gates has participated in numerous different activities, including the SHARE Foundation and EDEF grants, Reading Council programs and projects with the SAAC and the South Arkansas Symphony Orchestra. 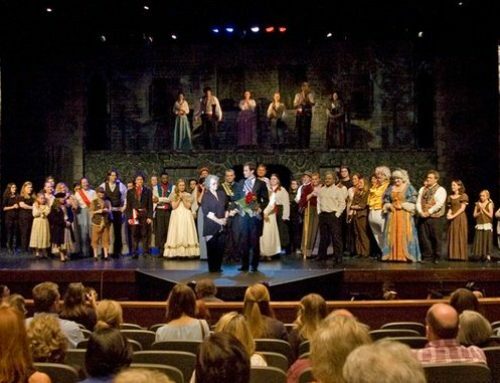 Most recently, she helped bring to the stage the community-wide production of “Les Miserables.” Gates’ students have won many theater competitions, performing in such places as New York City and Edinburgh, Scotland, on four occasions. She is an active member in local, state and national organizations and has presented conferences throughout the United States. Stacy Hawking choreographer • Hawking is a senior BFA Musical Theatre major at Ouachita Baptist University originally from Sherwood, Ark. She has been seen in many productions at OBU including: “Shrek,” “Guys and Dolls,” and “Hello, Dolly!” She has also been in many main stage productions at the Arkansas Repertory Theatre including: “White Christmas” and “Hairspray.” She has been a participant of the Rep’s SMTI program for the past nine years and an assistant choreographer to the program for the last five years. She’s choreographed for OBU’s “Festival of Christmas” for the last two years and the Ouachita Sounds for the last three years.